Still trying to decide what to serve for dessert at your family holiday gathering? Heather Goldberg and Jenny Engel of Spork Foods have created a delicious recipe, perfect for enjoying with friends and family over the holidays. Utilizing Pistachio Chewy Bites, the sister chefs have created individually sized rum cakes that are sure to wow your crowd. In a measuring cup, add almond and apple cider vinegar and set aside to curdle, about 1-2 minutes. To a large mixing bowl, add flour, cinnamon, allspice, baking powder, sea salt and sugar and whisk until uniform. Add molasses, ginger, vanilla extract, rum, oil and curdled almond milk mixture. Whisk until smooth and uniform. Grease mini bundt pan with cooking spray and sprinkle ground pistachios into each section. 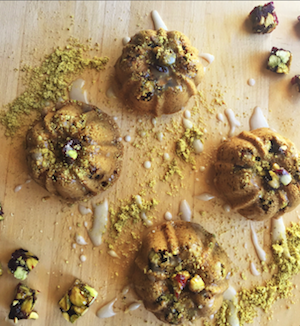 Tap to shake and evenly disperse pistachios in each section coating lining of each mini bundt cake. Dice Setton Farms Pistachio Chewy Bites into small pieces and place a few in each bundt cake section. Pour about 1/3 cup batter into each bundt cake. Place in oven. Meanwhile, whisk powdered sugar and almond milk until smooth, for icing. Bake for 23-25 minutes or until toothpick comes out clean. Cool completely and drizzle each cake with icing. About the chefs: L.A.-based sisters and celebrity chefs, Heather Goldberg and Jenny Engel of Spork Foods are vegan chefs that own a Los Angeles-based gourmet cooking school. The culinary duo are also cookbook authors and work with some of Hollywood’s elite including Emily and Zooey Deschanel, Kristen Bell and Dax Shepard, Kristin Bauer van Straten and Alicia Silverstone. About Pistachio Chewy Bites: With two main ingredients, Pistachio Chewy Bites provide healthy snack lovers the amazing benefits of pistachios and cranberries in a delicious and nutritious bite-size bar. Pistachio Chewy Bites are heart-healthy, 100% all natural, gluten and dairy free, low in sodium, GMO free, vegan and a great on-the-go protein snack. They also have no cholesterol, zero trans-fat and are a good source of dietary fiber. These nutrient-rich snack bars provide a great balance of carbohydrates, protein and fat for sustainable energy. With 7 grams of protein, 3 grams of fiber and healthy fat, the individually wrapped bars are the perfect one stop shop. I love this recipe with its combination of spices, healthful ingredients and pistachios. I would make this any time of the year , but especially between Thanksgiving and New Year's Day. I do not yet own mini bunds pan, so I shall look for them first.